The Roar of the Incredible Hulk! With the release of our new X16 series loggers, it was time to take another trip to Universal Studios and collect new theme park data. The faster sample rates afforded by the new design allows a different perspective on roller coasters. In particular, the Hulk roller coaster at Islands of Adventure provided an excellent case for showing vibration analysis of a roller coaster. The Incredible Hulk roller coaster is one of our favorite rides at Universal Studios' Islands of Adventure. The assisted launch, loops, and inversions provide repeated opportunities to expel your over-priced theme park lunch. For those unfamiliar with this ride, the coaster has a distinct audible "roar" as it twists through the 3700 foot long track. It's a great effect that accentuates the thrill of the loops and inversions. Many customers have requested our R scripts for analyzing roller coasters. With summer just around the corner, what better way to start the vacation season armed with an X16 logger, tickets to your choice amusement park, and a simple R script. Click here for instructions detailing our analysis methods. The X16-4 was attached to the seat using a strip of double-sided tape. The seat was located near the mid-point of the roller coaster train. Ideally, the logger should be attached to the car frame. Unfortunately, Universal Studios security discourages guests from stopping the ride to crawl underneath the roller coaster! The logger was configured to record at 800Hz continuously and it was activated just prior to boarding the train. Below is a sprectral energy comparison of the Hulk and another roller coaster at Islands of Adventure called Dragon Challenge. 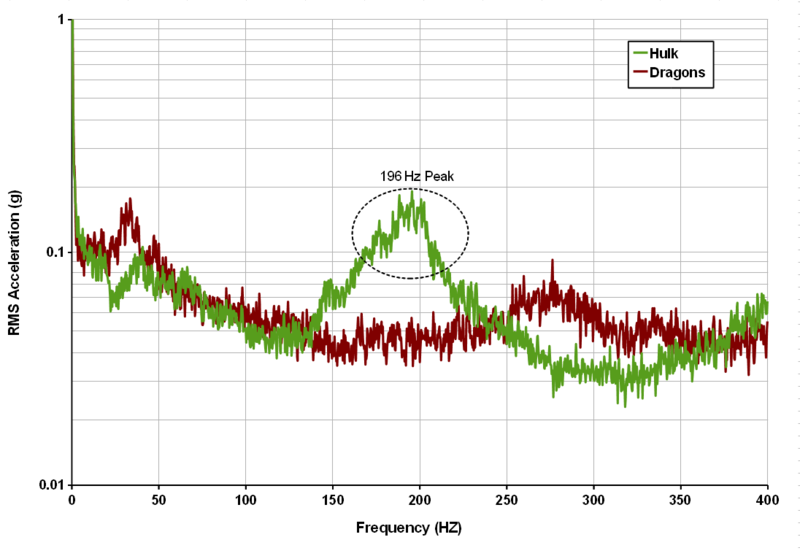 Notice the noise was detected by the X16 logger as a distinct 196Hz frequency peak, which is unlike any other coaster. The data was processed through an R script to separate the coaster motion (low frequency) from the "roar" noise (band pass between 185 and 205 Hz). The two data sets were plotted together to illustrate the occurrence of the "roar" as the rider was subjected to increased g-forces. Note that the plotted data is the root-mean-square (RMS) acceleration of the three axes. Therefore, the plot is showing lateral g's as well. 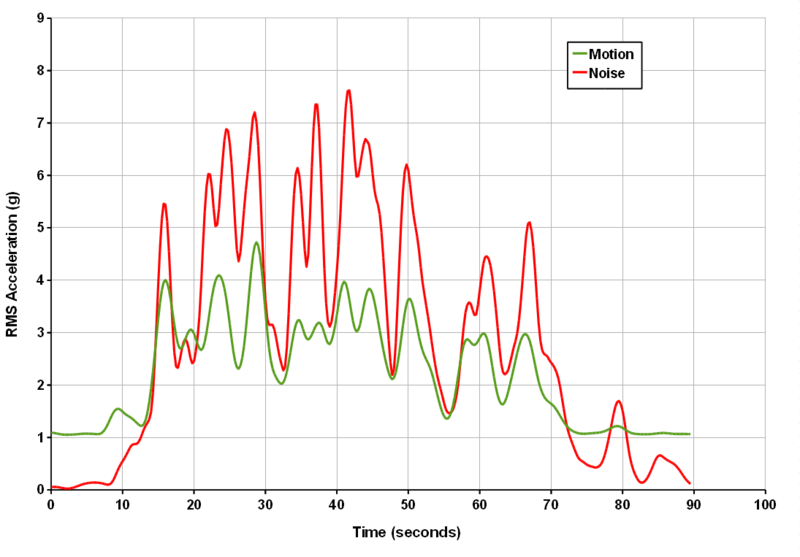 Although the "roar" is an intentional feature of the Hulk ride, the experiment shows that the X16 logger can be used to detect other unintentional or abnormal conditions, such as wheel bearing noise. Occasional checks compared to a typical train "signature" will indicate if abnormal conditions are present, which can then initiate preventative maintenance work.